remember the first lunch we had to attend last tuesday? it was for the press con for the new line of kérastase products called age premium, which were made specifically for, er, mature hair. we are so there! the lunch was held at the terrace at 5th, which is becoming a favorite venue for press cons and launches. when we got there, we saw a lot of "ladies who lunch" in attendance—oh, we get it, kasi pang mature hair! actually, feeling ladies who lunch na rin kami kasi we don't have an office job anymore (well, for now at least). 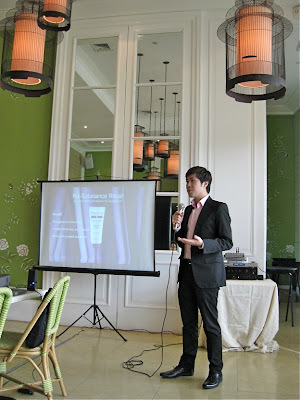 here's birdie salva, senior product manager of kérastase, telling us why we need this product! if you want to know about hair, this is the go-to guy. he even has a helpful blog that you should check out if you have any hairy queries: hair in manila. plus he often has contests with lovely luxurious products for prizes. anyway, not to get all technical, but this is what we learned: basically, as you age, the natural hormonal imbalance that occurs changes the structure of the hair, making it more fragile, sensitive, dry, thin, and prone to breakage—basta, all those bad things. so kérastase age premium has a new technology that supplies mature hair with calcium, anti-oxidants, UV filters, vitamin F, and ceramides—all the good things your hair needs. 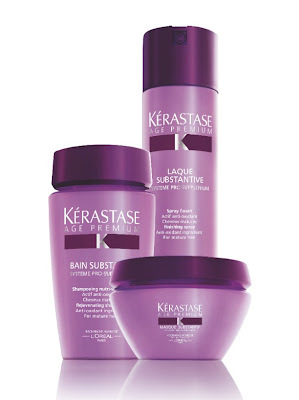 you can go to the kérastase institute by salon esa at 6750 ayala avenue to get the professional treatment, then use the above three products—shampoo, masque, and hairspray—for at-home maintenance.